I played the violin for several years in my school&apos;s orchestra growing up, so I will always have a soft spot in my heart for the symphony. There&apos;s something about the music performed by symphony orchestras that is just so beautiful. The variety of sounds created by the different instruments is fascinating, and the changes in dynamics during many pieces can be breathtaking. 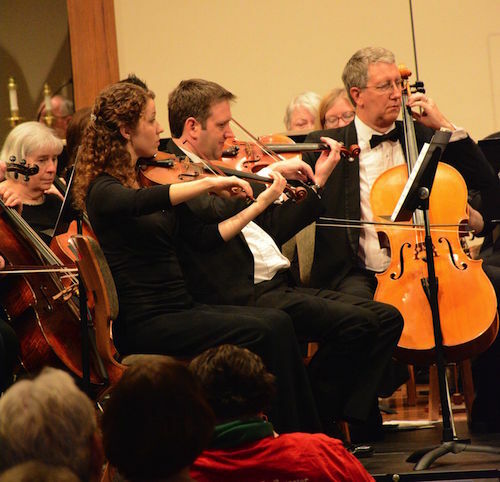 Hendricks County is fortunate to have two wonderful symphonic groups -- the Hendricks Symphonic Society and the Indianapolis Symphony Orchestra -- that perform locally. What I love about the Hendricks Symphonic Society in particular is that the society not only performs orchestral music, but many of the concerts also include the Hendricks Symphony Chorus, "Joyful Voices" Youth Choir, small vocal ensembles, soloists, and more. If you&apos;re interested in experiencing these groups for yourself, there are two opportunities coming up next week in Hendricks County. Both, coincidentally, are on Jan. 31. The Hendricks Symphonic Society has a free concert at Bartlett Chapel United Methodist Church at 3 p.m. Jan. 31. The concert, Chamber Music IX, will feature a variety of ensembles including a women&apos;s vocal trio and a barbershop quartet. The Indianapolis Symphony Orchestra, as part of its 317 Series, will perform The Planets at Avon High School at 3 p.m. Jan. 31. Tickets for this concert are $10 for children and students and $20 for adults. The ISO also will perform Pictures at an Exhibition at 3 p.m. Sunday, April 3 at Avon High School. I spoke recently with Hendricks Symphonic Society conductor Benjamin G. Del Vecchio about the Jan. 31 concert, as well as the remainder of the 2015-2016 concert season. Del Vecchio is certainly passionate about the Hendricks Symphonic Society, and the music the group performs. He made me want to add all of the upcoming performances to my calendar. There were a couple, though, that especially piqued my interest. On Feb. 26 at 7:30 p.m. and Feb. 28 at 3 p.m. at the Avon Middle School North auditorium, the Hendricks Symphonic Society&apos;s concert Northern Exposure: Music From Northern Countries will include Pictures at an Exhibition, which was composed by Russian composer Modest Mussorgsky. This concert will feature paintings by local artists that represent each of the 10 movements of the Pictures at an Exhibition suite. The paintings will be auctioned off as a fundraiser to support the Hendricks Symphonic Society. In March, the Hendricks Symphonic Society will celebrate St. Patrick&apos;s Day with their Irish Festival concert. This concert will feature the Hendricks Symphony Chorus, "Joyful Voices" Youth Choir, the Irish Dancers of Indianapolis, and instrumentalists. The concert will be performed March 11 at 7:30 p.m. and March 13 at 3 p.m. at Avon Middle School North. Tickets are $5 for students and $12 for adults if purchased in advance, and $7 for students and $15 for adults if purchased at the door. Tickets are just $12 for people over the age of 65. There is a 50-cent service fee for tickets purchased online. Friday, Feb. 26 at 7:30 p.m. and Sunday, Feb. 28 at 3 p.m.
Friday, March 11 at 7:30 p.m. and Sunday, March 13 at 3 p.m.
Sunday, April 3 at 3 p.m.
Friday, April 29 at 7:30 p.m. and Sunday, May 1 at 3 p.m. The Hendricks Symphonic Society will also perform at Plainfield&apos;s Fourth of July fireworks show.